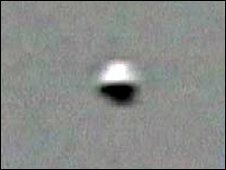 A bride-to-be has spoken of her shock after her engagement party led to reports of UFO sightings in her hometown of Coalisland, County Tyrone. The sight of what is now known to have been sky lanterns is said to have left some residents "astounded", according to the (Dungannon) Democrat newspaper. Bronwyn Gervin said she couldn't believe it when she was contacted by friends about the article. "I was so shocked to see such a story," said the 26-year-old. "I received text messages from numerous friends a couple of days after the event saying that there was a large picture in the Democrat of a mysterious sighting in Coalisland at around half eleven last Saturday night. "The lanterns were lit in memory of our close family and friends that predeceased us." Another related to a sighting over nearby Glenavy in 1989.